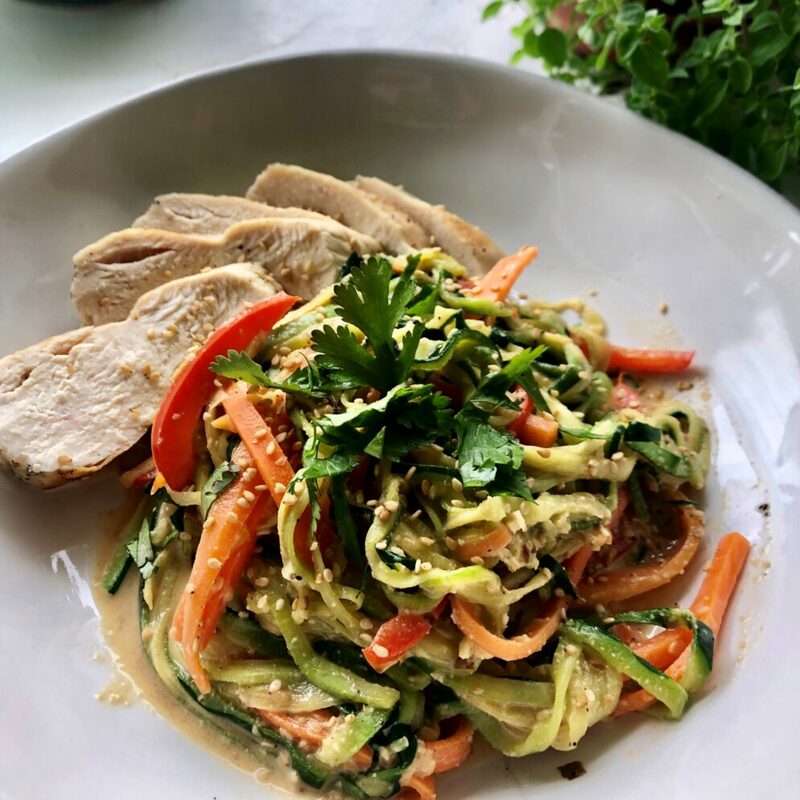 “Zoodles”, or zucchini noodles, are a delicious way to satisfy your spaghetti or noodle craving while maintaining a grain free diet. 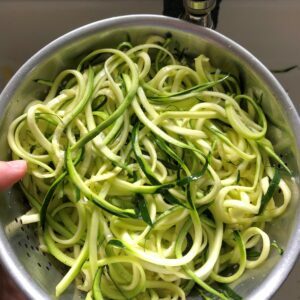 To make them, you’ll need a spiralizer, but they come in many forms, from tight budget to zoodle-level: expert. Zoodles are easy to make, cook quickly, and have a mild flavor that highlights whatever sauce you coat them with. One great option is a thai cashew sauce (peanuts are a no-no during the cleanse). While on the Restorative Cleanse, nut butters are technically fair game, but you must be careful to read the ingredients as most are sweetened and you’ll be trying to avoid all sugar. 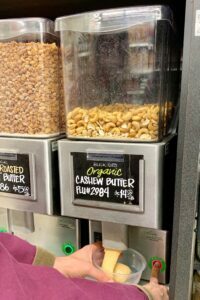 If you have access to a natural health store that allows you to grind your own, try taking home fresh ground cashew or almond butter (always opt for raw, unsalted nuts if they’ve got them). 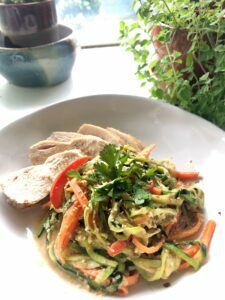 Once you’ve spiralized 3 zucchini into zoodles, consider sprinkling with salt and letting them sit in a strainer over the sink for at least a few minutes while you prepare the other veggies and cashew sauce. Zucchini hold a lot of water and salt will draw some of it out so that your finished dish won’t be too runny. You can even rinse some of the salt off before you add the zucchini to the pan, so feel free to be somewhat liberal with your sprinkle. Depending on the way your spiralizer works, you may also want to spiralize your 2 carrots. Alternatively, they can be julienned, cut into small strips, or grated. You probably won’t be able to spiralize a bell pepper. Just cut it into small strips. If you are avoiding nightshade veggies on your cleanse, leave out the bell pepper. Keep all of your prepared veggies at the ready. For the sauce, start by finely chopping 2 pitted medjool dates. This recipe will make up to 4 servings, so a half a date in each serving won’t ruin your cleanse, but remember to be sparing with all sweeteners (even the natural ones). Finely chop 2 cloves of garlic and grate about 1 cubic inch of fresh ginger. Mash dates, garlic, and ginger together with a fork at the bottom of a small bowl. Add a ½ cup of cashew butter (unsweetened sunflower seed butter or raw almond butter would also suffice) and mix the paste well. Stir in 2 Tbsp of lime juice (about ½ of a lime), 1 Tbsp sesame oil, and 4 Tbsp coconut aminos. Coco aminos have a flavor that is reminiscent of sweet soy sauce, but again, soy is a cleanse no-no, and aminos are a health boost. If you enjoy or don’t notice the difference in a recipe, consider making this healthful substitution even after your cleanse is over. Add red pepper flakes if you like a spicy little kick, but be sparing! Whisk well and set the sauce aside for later. Pat 2 chicken breasts dry, coat them in olive oil, and season with salt and black pepper. Pour 1 more tbsp of olive oil into a large frying pan heated to medium and then add the chicken. Let the breasts cook on medium for about 10 minutes, or until the edges are opaque. Then flip the chicken breasts over, cover the pan with its lid and turn the heat down to low. Cook another 10 minutes, remove the chicken from the pan and let the breasts rest, without cutting them, for at least 5 minutes. This rest time is important and can be the difference between tender, juicy meat and rubbery, dry meat. Back in the sink, rinse the salt off your zucchini noodles with water and squeeze them gently to release excess liquid. Then check out the pan where the chicken was cooked and turn the heat up to medium-high. Pour off remaining liquid and heat another Tbsp of olive oil before adding the zucchini, carrots, and bell peppers. Once in the pan, stir veggies frequently, until they have just started to soften (2-3 minutes). Remove the pan from the heat. 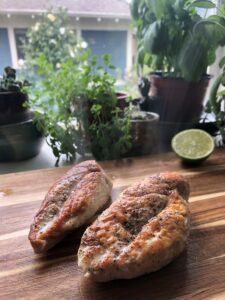 Slice the chicken breasts, against the grain, into strips or bite-size pieces and add them to the veggies. Drizzle with the sauce and toss gently to coat. Sprinkle with sesame seeds and chopped cilantro and serve hot!